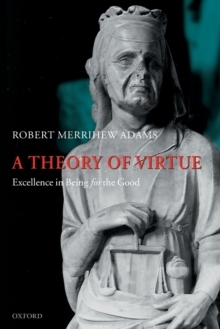 The distinguished philosopher Robert M. Adams presents a major work on virtue, which is once again a central topic in ethical thought. A Theory of Virtue is a systematic, comprehensive framework for thinking about the moral evaluation of character. Many recent attempts to stake out a place in moral philosophy for this concern define virtue in terms of its benefits for the virtuous person or for human society more generally. In Part One of this book Adamspresents and defends a conception of virtue as intrinsic excellence of character, worth prizing for its own sake and not only for its benefits. In the other two parts he addresses two challenges to the ancient idea of excellence of character. One challenge arises from the importance of altruism in modern ethical thought, and the question of what altruism has to do with intrinsic excellence. Part Two argues that altruistic benevolence does indeed have a crucial place in excellence of character, but that moral virtue should also be expected to involve excellence in being for other goods besides the well-being (and the rights) of other persons. It explores relations among cultural goods, personal relationships, one's own good, and thegood of others, as objects of excellent motives. The other challenge, the subject of Part Three of the book, is typified by doubts about the reality of moral virtue, arising from experiments and conclusions in social psychology. Adams explores in detail the prospects for an empirically realistic conception of excellence of character as an object of moral aspiration, endeavor, and education. He argues that such a conception will involve renunciation of the ancient thesis of the unity or mutual implication of all virtues, and acknowledgment ofsufficient 'moral luck' in the development of any individual's character to make virtue very largely a gift, rather than an individual achievement, though nonetheless excellent and admirable for that.